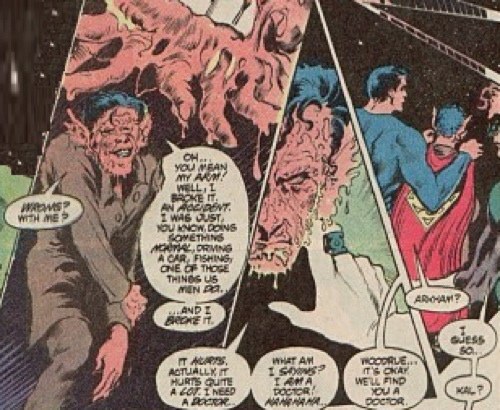 Continuing the critical analysis of the Swamp Thing character as it transitions from creative control of Len Wein and Berni Wrightson to Alan Moore, Steve Bissette and Jon Totleben. 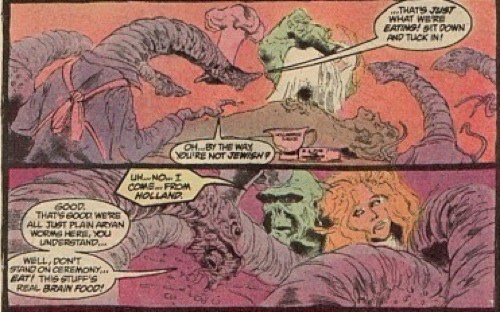 In his Saga of the Swamp Thing run, Moore has many plays on words and puns, such as when the worms ask if Holland is Jewish because they are plain Aryan worms (Planarian Worms), or the fact that one of the condiments next to Holland’s corpse is a gravy boat of Hollandaise Sauce. They are easy puns, and show a sophisticated humor absent from many mainstream comics, but they are also representative of the ways in which language and identity may always be twisted, always able to mean something else. The sequence ends with Swamp Thing approaching the dining table with Holland’s human body, only to find that the worms have eaten all of him and nothing remains but a skeleton. Although this depicts the unsightly, yet natural ways in which the earth consumes the flesh after death, the planarian worms turn to Swamp Thing saying, “We left you the best part. We left you the humanity. Try not to lose it.” And so Swamp Thing walks away, carrying the weight of human consciousness with the skeletal remains of Alec Holland, fighting off an imaginary barrage of monsters that he thinks are trying to steal his humanity. This long dream sequence is the primary mode for setting up and explaining Swamp Thing’s identification conflict. Told through nightmarish images, it represents the surreal and absurd ways our consciousness both defines and tortures us. However, compared to the more lucid narrative of what one may think of as the primary conflict--Swamp Thing confronting and defeating the Floronic Man--the dream narrative is the most visually organized section, with panels leveled and split into two or three evenly-spaced squares. The “waking life” panels are contrastingly abstract, fragmented, overlapping and asymmetrical, and text breaks panel lines, wraps curved images and often dissolves into the bottom of the page. A page of panels fall quickly into a chaotic splash page, like the lower half of the paper is attempting to consume the broken organization of the top. Bissette’s artwork is a visual depiction of the intensity in Moore’s writing. The fragmented and asymmetrical panels that drive most of the narrative compliment Swamp Thing’s difficult desire to resolve an identity that does not completely embrace the grand narratives of Man and Nature that dominate traditional ways of thinking about the relationship of self to the world. Bissette presents a narrative that is always falling apart, the broken panels representative of a larger paradigm shift in which grand narratives and objective realities are challenged by postmodern subjectivities. Here, life struggles within frames, and always seems to be breaking past the confinement of homogenous structure. The dream sequence in Moore’s first arc of The Saga of Swamp Thing illustrates the conscious desire to provide narrative structure to experience, to make life fit neatly within the borders, displaying control, clarity and cohesion. Swamp Thing’s grip on Alec Holland’s skeletal remains represents a desperate need to cling to a modernist notion of the self. The planarian worms of the nightmare tell him “humanity” is all that’s left, and that humanity is characterized by an intangible consciousness, the metaphysical, or a soul that makes one human. Swamp Thing reaches for the tangible and physical in an attempt to find stability in structural form. Swamp Thing is denied a way of thinking of himself that doesn’t rely upon a human or non-human decision. Is it impossible to be both human and non-human at the same time? His challenge is to construct an identity situated between binaries, existing in the spaces between ecological relations. As the story arc progresses, Swamp Thing slowly lets go of Alec Holland and begins to see himself as an integral component of a larger network of systems. Swamp Thing becomes in tune with other beings of the natural world, and like any ecosystem, his identity begins to break apart from confined locality (a ‘power’ developed more fully with the introduction of John Constantine and the Parliament of Trees). The corporeal body as the physical definition of the self gives way to a self defined by the interactions with other natural human and nonhuman systems. This enlarged identity, aware of the interconnectivity between the collective consciousness and the interplay between participants in an ecosystem, becomes a new way of thinking about the self. Not only does a conscious connection to a vast ecosystem break physical locality, it also breaks temporal locality as Swamp Thing remarks that he is now “somewhere quiet…somewhere green and timeless…my awareness…expanding out through the forgotten root systems…am I at peace? Am I…happy? Oh yes.” The ecologically-minded consciousness Swamp Thing experiences is referred to simply as the “Green.” With this “eco-mind" comes a new understanding of the dominant social paradigm. Eco-feminist, physicist, and activist Vandana Shiva explores the destructive values of the dominant social paradigm, arguing that the dominant paradigm attempts to understand and manipulate the world “based on reductionism, duality, and linearity,” things that are “unable to cope with equality in diversity, with forms and activities that are significant and valid, even though different.” Ultimately, Shiva reframes contemporary notions of development as “maldevelopment” which is a “violation of the integrity and harmony of man in nature, and the harmony between men and women.” In understanding the Green, identity is not defined in opposition or violation to things, and ideas of the self are not dependent upon human/nonhuman differences, but instead dependent upon the relationships between distinguished objects, stressing the significance of connection between human and nonhuman. Woodrue’s megalomania seeks the Green as a tool to expand the reaches of his power and influence. Seeing how Swamp Thing’s expanded consciousness and connection to the natural world came about through the swamps ability to ingest conscious memory, Woodrue harvests part of Swamp Thing’s body and hopes that by consuming him, he will also feel a connection to the Green. 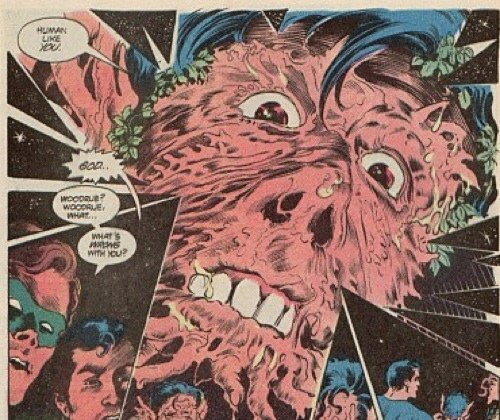 When the Floronic Man enters the Green, he harnesses his connection with diverse plant life to exact revenge upon human populations for the environmental devastation they have brought about. The Floronic Man’s power reaches beyond his small physical form, and he is able to grab and hang innocent humans with conscious vines and tree limbs. With the simplicity of a middle school earth science class, Swamp Thing explains to Woodrue that his plan for a massacre from hyper-oxygenation will not succeed because humans are needed to change oxygen back into the gasses that plants need to survive. The symbiotic relationship between carbon-based animals and plant photosynthesis is surprisingly enough to bring Woodrue to his knees and his plan for human and animal annihilation to a halt. But the simplicity of the conclusion to the conflict with Woodrue is at odds with the larger unresolved themes of the arc—namely what it might mean to rethink who we are and how we perceive ourselves. As the arc concludes, Swamp Thing walks back toward his swamp with Abby, a good friend and confidant, and one of the few humans who does not see him as a monster or potential ecological weapon. He turns toward her and says, “Alec Holland is dead. He died many years ago, in an explosion. But it has taken him a long time to lie down. He’s gone now. He’s at rest.” When Abby asks “Who are you,” Swamp Thing replies, “I? I am…The Swamp Thing.” Ultimately this resolution is unfulfilling. Letting go of a humanity based upon human/nonhuman opposition with his symbolic burial of Alec Holland, Swamp Thing has embraced a new identity built upon an expanded consciousness with a network of living and nonliving things. His final line to Abby, “I am…The Swamp Thing” is significant because while he is now able to perceive himself not as a separate being apart from humanity, but as a dynamic being in a process system of which humanity is a part, he is still limited by the anthropocentric terms that position human and nonhuman in polemical configurations. Unfortunately, Swamp Thing is the only character that must reconceptualize the idea of the self in ways that seek to understand how ecosystems inform our being. Compounding the problem are modernist philosophies of difference between man and nature that haunt language. In the process of becoming anew, “Thing” becomes the nebulous sign able to tread the space between those terms, and until an epistemology which posits human and nature in an uneven, hierarchical structure is challenged, Swamp Thing will forever be bound by a discourse that is not ecologically-conscious.